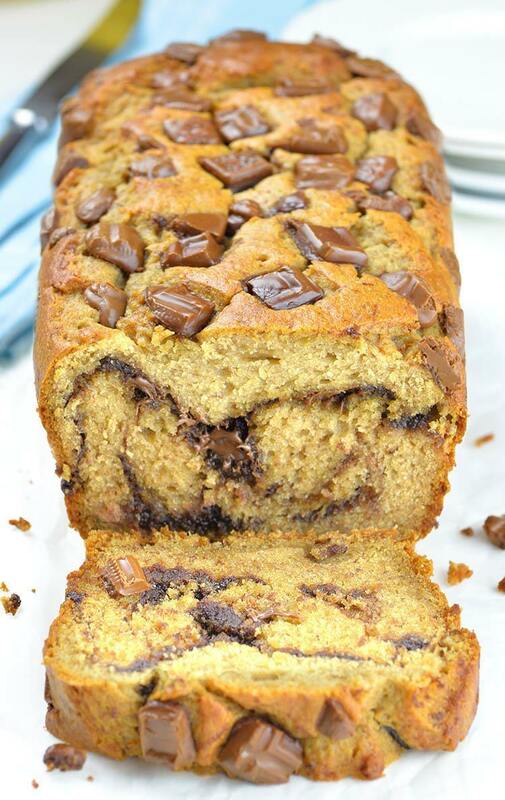 Peanut Butter Banana Bread swirled with Nutella and topped with chocolate chunks is the best and the yummiest snack or breakfast you could make ahead for busy mornings. It’s easier and faster to prepare than the the equally tasty peanut butter cheesecake. Despite the fact that I I’ve already shared so many banana recipes past few months, here I go again. I can’t never say no to a yummy banana baked goods. My favorites so far were Easy Banana Magic Cake, Banana Upside Down Cake and Skinny Banana Muffins.And when I made my Banana Bread Blondies, I realized that I haven’t made classic banana bread for a long time. However, this Peanut Butter Banana Bread could hardly be called a classic. There’s no butter and oil in the batter, just peanut butter (check out this delicious chocolate peanut butter cheesecake recipe!) and Greek yogurt. And it’s full of everything you like: sweet bananas, chocolate chunks, smooth and creamy peanut butter and Nutella… Yes, a lot of swirled Nutella!!! If you don’t like peanut butter and you don’t like Nutella, than you probably won’t agree that this is the best banana bread ever. 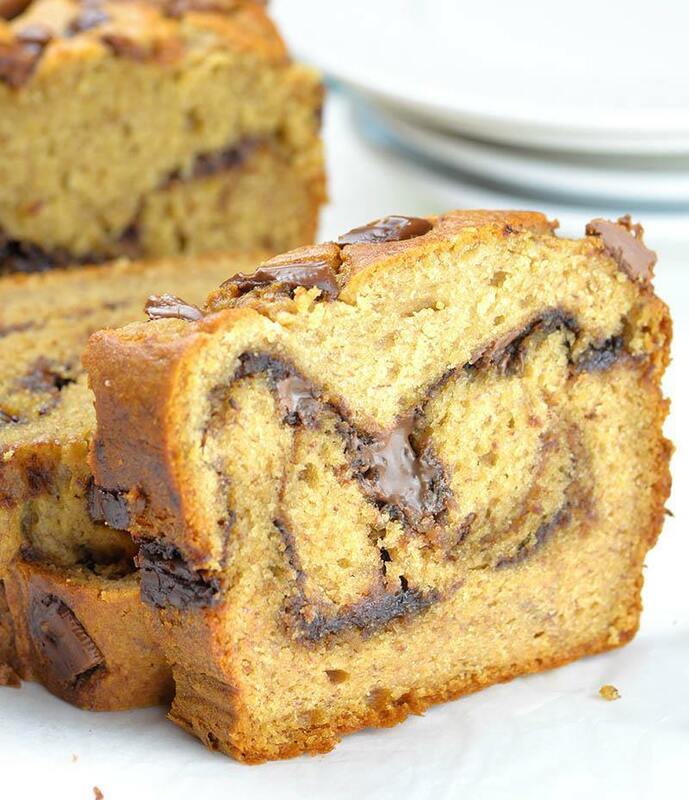 On the other hand if you are Nutella and peanut butter addict like I am, you must try this super moist Peanut Butter Banana Bread swirled with Nutella. There won’t be a crumb leftover! This Peanut Butter Banana Bread recipe is really simple and easy to make. You don’t have to mix the batter too much. Just blend everything together and try not to over mix. Spread the mixture in a loaf pan, swirl with Nutella, sprinkle chocolate chunks on top and place in the oven. You can sit and enjoy the wonderful smell that spread through your home. But you must be patient. First you have to wait almost an hour to bake the bread and then another two hours to cool before cutting into it. Peanut Butter Banana Bread swirled with Nutella and topped with chocolate chunks is the best and the yummiest snack or breakfast you could make ahead for busy mornings. Preheat the oven to 350 F. Spray 9 x 5 inch loaf pan with non-stick spray. You can line the bottom with parchment paper leaving an overhang the sides so you can lift the bread easier from the pan. Set aside. In a medium bowl whisk together flour, baking powder, baking soda and salt, set aside. In a large bowl beat the eggs just a few seconds, then add Greek yogurt, peanut butter, sugar, brown sugar and vanilla and mix just to combine. Add mashed banana and mix to combine, do not over mix the batter. Add dry ingredients mixture and stir until just combined. The batter will be thick. Spread 1/3 of the batter in the bottom of loaf pan. Drizzle with 2-3 tablespoons of Nutella. Spread another 1/3 of the batter, drizzle again with 2-3 tablespoons of Nutella. Spread the remaining batter, swirl with the knife, smooth the top and sprinkle with milk chocolate chunks. Bake for 50-60 minutes or until the toothpick inserted in the center comes out clean. Baking times may vary depending on your oven and type of pan you use. If it starts browning too much, tent the top with aluminum foil after 20-30 minutes of baking time. Let it cool in the pan for 10 minutes. Loosen the edges with the knife and transfer the bread to a rack to cool completely before cutting.